17 YA AUTHORS + DISNEYLAND = THE YAPPIEST DAY ON EARTH! 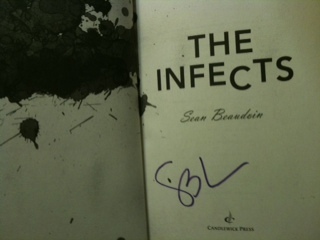 The 6th YAppiest Giveaway is for an author signed copy of The Infects, by Sean Beaudoin. A smart, irreverent zombie apocalypse tale with an ending you won’t see coming! I’ll contact you via email for your address. For a complete list of YAppiest Giveaways, go here. If you couldn’t make The YAppiest Day on Earth, never fear! The YAppiness keeps rolling with epic read giveaways by each of the 17 authors. This is the 6th YAppiest Giveaway! For a chance to win, see “Here’s How”. For a complete list of upcoming giveaways, go here. Life’s been rough on seventeen-year-old Nero. His mother left him and his younger sister with his unemployed father, who insists that Nero pay rent. Hence his night job at the chicken factory, while trying to finish high school during the day. Then there’s the direct-dialog feed from The Rock (yes, that Rock) in his head, which doesn’t help his self-esteem. No wonder he can’t bring himself to ask Petal–the girl of his dreams–out. Things can’t get much worse, or so Nero thinks, until a freak accident at the factory lands him on an Inward Trek wilderness outing with a bus load of other juvenile delinquents. Nero sinks even lower when he sees Petal on the girls’ juvy bus heading for the same patch of wilderness, because he knows it’s because of what he did. Nero’s nightmare turns into the real deal on their first night at camp, when his counselors turn into the flesh-eating walking-dead, and a few of his fellow inmates become late night snacks. Zombies. Sure, Nero’s seen all the movies. But it takes witnessing the gory carnage up close to process the reality. Blood spurts and flesh flies as the survivors run into the woods, with a horde of not-so-shambling monsters on their tails. Nero quickly realizes that these zombies are faster than the ones in the old movies, and can reason too. Thinking zombies are never a good thing. Drawing from their horror-flick savvy, Nero and his fellow survivors develop a list of Zombie Rules. Unfortunately, it takes more than zombattitude to keep ahead of the baddass biters. I was never a big zombie fan until NOW! The Infects won me over, with its quirky, irreverent characters slinging wickedly funny dialog as fast as the furious plot turns. In addition to the clever tongue-in-cheek dark humor, The Infects delivers characters we can’t help but care about and root for. My problem with the old-school zombies is that they’re dumb as dirt, slow as slime, and about as cohesive. Oh, and they lack that certain je ne sais quois the other classic monsters have. Old-school zombies are all moaning and groaning rotting flesh, no smart surprises or witty repartee. The Infects changes all that, taking a traditional horror story, turning it on its head, then spinning it around just for kicks. As with any horror story worth its claim to the genre, there’s plenty of blood and gore. But The Infects dishes it up with such over-the-top style, that you half expect Quentin Tarantino to step into the picture. Similar to Tarantino’s filmatic style, The Infects succeeds in morphing a standard genre to create a new one. Hollywood, are you listening? The Rock’s unsolicited commentary in Nero’s head is another genre-bender example that is flat-out hilarious. Better still … there’s an honest payoff for The Rock in the end. Unfortunately, that’s all I can say without risking a serious spoiler. And you would hate me if I ruined the ending for you. It’s that good. …a savvy tale that’s a delight to read—whether you’re a rabid zombie fan or freshly bitten. I’m the second one. Freshly bitten, and hungry for more. The jury’s still out on whether there will be a sequel, but I’m hoping so. Want to win an Author Signed Copy? 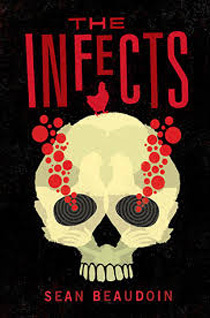 For this riotously awesome book, I have a special treat for one lucky winner… An author signed copy of The Infects! NOTE: The FREE giveaway of a copy of this book is open to residents of the United States and Canada only, due to shipping costs. My sincere apologies. Leave a comment on this blog by midnight, July 7th (1 entry). 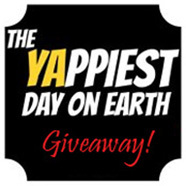 Tweet about this giveaway, including #yappiest in your tweet (1 entry). I’ll tally the entries and choose a winner at random, then announce it on this blog on Wednesday July 10th. Good luck! Stay tuned for more YAppiests Giveaways!